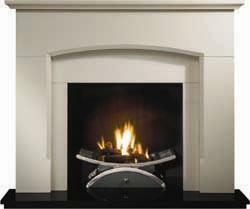 Fires | Fireplaces | Stoves: What Is A Decorative Fire? What Does It Mean By A Decorative Fire? Aren't All Fires Decorative? What Does It Mean By A Decorative Fire? 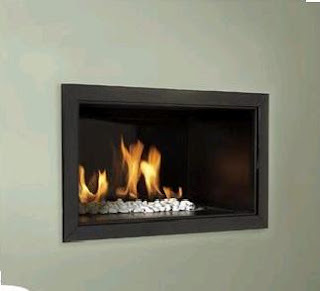 The term decorative fire is used to describe larger open fires such as baskets or the Verine Atina. These fires all have 1 thing in common, a large opening and a large area around the flames in the centre, although this finish does create stunning finish that really showcases the living flame effect inside, this large empty space is unfortunately the reason that these fires are decorative only. Everyone knows that hot air rises, and as the hot air from the large open flames rises, it rises up the chimney, this natural convection draws air from the room into the fire to be heated and rise up the chimney, this natural air current draws all the warm air up and out the chimney, a normal chimney will draw all the air out of the room every 2 hours. This natural draw means that all the hot air will rise up the chimney with only radiant heat warming the room, meaning that these fires are incredibly inefficient and shouldn't be relied upon as a source of heat, as it all goes up the chimney! Strictly speaking...Yes! All fires are decorative, they are all part of the decor of the living space so are decorative. But when lit they aren't just decorative, they provide heat as well, which is the main difference between a decorative fire and other gas fires, when lit a decorative fire is just that...decorative! Where as another fire would give out heat as well as showcasing the living flame effect.